We've been providing portable and permanent resilient flooring for studio, stage, and touring. Whether you’re opening a new dance studio or are remodeling an auditorium and stage at a school, one important thing you’ll want to decide is finding the perfect dance floor. Performance surfaces are perfect for stages, theaters and dance studios. With unique qualities like sound absorption and the ability to take a lot of wear, these surfaces were designed for these types of environments. When you’re trying to choose the right flooring, you need to think about how it will be used. Stagestep offers a variety of different flooring options. With so many choices, you’re better equipped to make the right decision. Timestep Dance Floors are great multipurpose floors that can take a lot of hard use and still look great. Bravo Dance Floors are more lightweight and are also reversible. Dancestep Dance Floors are portable and appropriate for every style of dance except tap. Rave Dance Floors are ideal for any space that’s used for many different things. It is lightweight and portable flooring that’s also very economical. Quietstep Dance Floors are meant for more delicate styles of dance such as ballet and contemporary. This flooring has the ability to muffle noises, giving full attention to the performance. Woodstep Dance Floors give the look of real wood without the higher cost and maintenance. It resists wear with its heavy-duty construction. Encore Hardwood Dance Floors are true hardwood dance floors, made from maple hardwood with an integrated sprung subfloor. When you’re looking for the ideal floor, you must consider how it will be used. A private dance studio will need a different type of flooring than an elementary school’s stage, and each floor will serve different purposes. If you have a multi-use space, roll-out, portable flooring may be the best choice. A dance studio at a university may be used for activities other than dance, like group meetings, yoga classes and more. But a private dance studio will be used for just dancing and may want more permanent flooring installed. This should weigh heavily on your decision. Maintenance is another important factor to consider. Knowing how often and what type of maintenance each type of flooring requires can be helpful when making a decision. All movement activity generates energy. Energy directly returned to the body can result in shin splints, back and knee problems, fatigue, strains, and even broken bones. A non-energy absorbent floor or flooring system is dangerous. It can result in injury and law suits. Concrete is non-energy absorbent. Any substance put directly on concrete does not remove you from the concrete unless it contains air (like foam). Basket weave and foam sprung floating subfloors provide shock absorbent characteristics that eliminate the problems associated with hard, non-absorbent floors. No floor can be the most absorbent and the most resilient at the same time. There is only so much energy and it can only be diffused in varying relationships of absorption and resilience. We call that “feel” and it affects performance. Different surfaces and subfloors have different “feels,” each appropriate for different styles of dance. Perhaps the most overlooked attribute of a floor is lateral foot support. Without lateral foot support, you cannot maintain balance. Today, the leading cause of injury is not shin splints but ankle injury, due in part to flooring systems that rely solely on absorbent materials or systems that are too spongy. A term you may come across is point elastic, meaning deflection of the floor at the point of impact. The greater the deflection, the more unstable the floor. Any floor / floor system that you can squish together in your hands (feels soft) can be dangerous due to lack of lateral foot support. In addition to absorbency, energy can be dissipated by resiliency — think of a diving board or trampoline. Energy transfers from the body to a subfloor that deflects and safely returns energy (spring). Wood is the best of the resilient materials. Safety is the number one issue with dancers and their teachers when it comes to floors. The first safety concern is the non-slip characteristic of the surface. Ballet dancers need very non-slip surfaces while contemporary dancers in bare feet need smooth giving surfaces so the floor does not cause injury to the bottom of their feet. Tappers need some give, yet also need the assurance under foot of a surface they can slide on. Ballroom and theatre dance require a “fast” (less non-slip) surface. What to do? In an ideal world, each dance discipline would have its own unique floor surface. Since this is unlikely, Stagestep offers floors that can be “adjusted” to meet the average needs of different dance disciplines. We also have finishes and treatments that can modify a floor surface to be more accommodating to other dance styles. The second safety concern dancers have is the ability of the floor to absorb and dissipate energy, and / or safely return energy (resilient energy). If the floor fails to absorb or safely return energy, the body becomes the shock absorber, resulting in fatigue, pain, and injury. A performer’s nemesis is concrete or any other surface that is hard and unyielding. The guaranteed way to get injured is to work on an unyielding, non-shock absorbing flooring system. Concrete is your enemy. 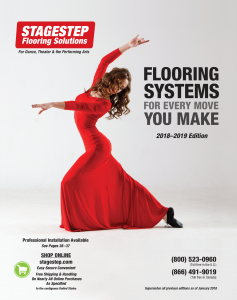 Stagestep features roll out floors and subfloor systems that protect the body from stress fractures, excessive fatigue, and joint stress. Dance studios see a lot of different styles, all with different techniques and requirements. Many of our floors are suitable for all kinds of dances, like our multi-purpose Timestep floors. We also have more specialized types of dance floors, like Quietstep, which absorbs sound, making it ideal for more delicate, lighter dancing types like ballet. Contact us at Stagestep to find the right stage flooring for your needs. Once we learn more about what type of floor you are looking for, we can help choose the right option for your studio or stage. We understand each of our clients are different, which is why we want to match everyone with the right product. * Sound reduction produces less than performance quality results. Stagestep offers three rollout marley-type floors that have heavy-duty wear surfaces and high-density foam underlayment. They can be installed directly over concrete and have very good absorbency, excellent performance, but reduce the level of sound generated. They are rated ideal for residual vibration and are excellent multi-purpose use flooring. Woodstep Plus and Woodstep Ultra are available in a woodgrain pattern. Dancestep II is available in black or grey. Encore, our hardwood flooring system, also has a built-in floating wood subfloor. All Springstep subfloors provide ideal lateral foot support to keep you balanced. Enhanced performance deals with sound amplification, jumping support, balance, and residual vibration. The ability of a subfloor to absorb post-impact vibration is important because keeping the floor still makes it easier to balance. Stagestep offers a variety of floating wood subfloors (with customized variations) to absorb, dissipate, and provide safe resilient energy return. All floor surfaces without foam backing provide no relief from a hard concrete slab. Check the adjacent flooring charts for relative characteristics and the ideal combination for your movement activity. Springstep IV–Is an easy-to-assemble set of panels, that require no tools to assemble. This floating subfloor assembles in 1/3 the time of a standard sprung floor and can be installed in permanent or semi-permanent studio space. We want to help all of our customers find the right solution for all of their needs. Whether you have a more general-use space or have specific requirements in mind, Stagestep has a floor that’s certain to suit you. With a variety of options to choose from, you’re in a better place to find just the right thing for your space.